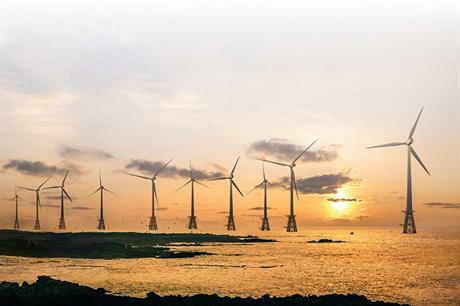 SOUTH KOREA: Six years after the country revealed its ambitions to become a big player in offshore wind, South Korea is commissioning its first utility-scale project. And there is much more to come as the Asian state prepares to develop its own industry from scratch. Since announcing plans for one of the world’s largest offshore wind projects — the 2.5GW Southwestern Offshore wind farm — in 2010, South Korea’s total installed offshore wind capacity has been firmly stuck at 5MW, from a two-turbine testbed in the coastal waters of the island of Jeju. However, over the past six months the country’s first utility-scale offshore wind farm has been taking shape, in the form of the 30MW Tamra project, also in waters around Jeju Island. Ten 3MW turbines, made by Doosan, were installed over the summer, with grid connection and full commissioning expected to be completed over the next few months. “Tamra is a huge step for South Korea,” says Hans Rijntalder, managing director of Netherlands-based offshore-wind engineering consultancy Wind Minds, which advises on offshore wind projects throughout the Asia-Pacific region. Read the whole article ….